The restaurant's parent company, Ark Restaurants, told workers last week this institution would be closing Jan. 12 because of dwindling profits. One of Boston's oldest restaurants announced last week it is closing after nearly 20 years in Faneuil Hall. Since then, diners have packed Durgin Park, trying to get their final meal. "We never had this much volume in seven years," Patty Reyes, the general manager of the restaurant, said. Everyone at the restaurant wants one more memory and meal. 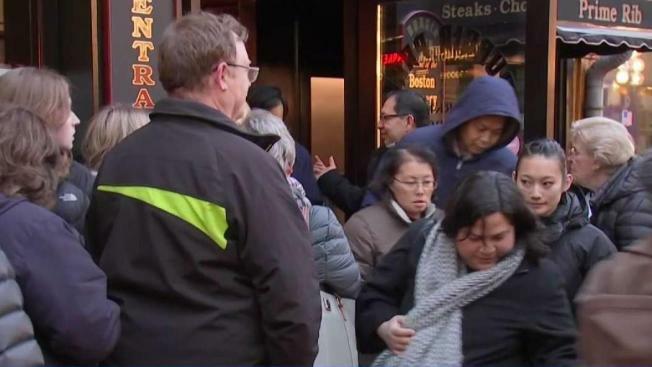 "We waited an hour in line just to get a table," another diner said. But disappointed customers waiting patiently outside were turned away Sunday evening. "Yeah, they cut us off. We're not getting in." According to the restaurant, they are running out of food. Russ Grand says he barely made the cut. "This is like my childhood revicited," he said. "If they got enough people to re-stimulate this place, reinvigorate it, I bet this place would make a fortune." Reyes says business is up, by 300 percent. Longtime waitress Gina Schertzer says the recent media attention and outpouring of support renewed interest in the Durgin-Park story, an establishment open since the early 1800s. She still believes it could stay open. "I'm hoping. I have every priest I know saying prayers," Schertzer said. The workers are now wondering if this recent pop in profits will be enough to turn things around, and convince the owners to give it another go. "People have come from Maine, from Canada, to pay their respects." The diners right now certainly aren't acting like they're at a funeral. It's a celebration of the restaurant. "I think they know now how important this restaurant is to people from all over the world." Reyes says they will reload for Monday's lunch rush and be ready for the remainder of the week.